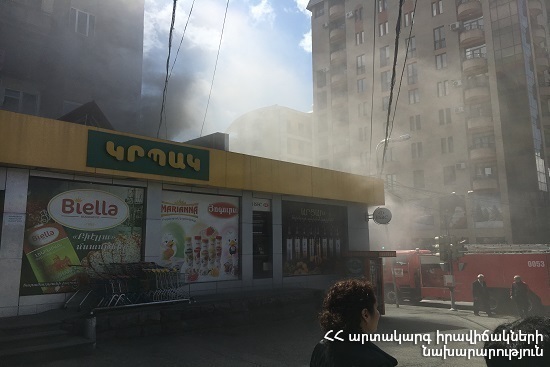 On April 11, at 12:20 an emergency call was received to “911” service that a short circuit of electric wires with fire had occurred in “Krpak” supermarket at the crossroads of Hrachya Kochar and Vagharshyan streets, Yerevan. Two fire units from the fire and rescue squad and the operative group of the National Crisis Management Center of the rescue service of MES of RA dispatched to the scene. It turned out that the fire had broken out in the cellar of “Krpak” supermarket at 16/1 Vagharshyan. The fire was isolated at 13:00 and extinguished at 13:35. About 5 refrigeration spare parts and the suspended plastic ceiling burnt in the store of the cellar of the supermarket and about 25 m2 of the suspended plastic ceiling of the adjacent area was damaged.